We’ve just had the penultimate weekend of our ‘special offer’ winter taster days, and it was a busy one. On Saturday Lottie & Colin came up from west Cornwall, John from Lostwithiel and Ian from Plymouth. Lottie is training to be a set designer and wanted to work on her 3-d design skills, she started on a very nice abstract piece and is planning to come back to complete it. John’s father was a craftsman who painted designs onto replica Chinese furniture – John chose a relief design of an oriental style fish that reminded him of his dad and did really well to complete it in a single day. Ian was with us for the whole weekend and worked on lettering throughout. He really gained in confidence & speed over the two days, completing a single word inscription on Saturday and following up on Sunday with the four elements, earth, wind, fire & water carved on each side of a block – a great effort to get this completed. 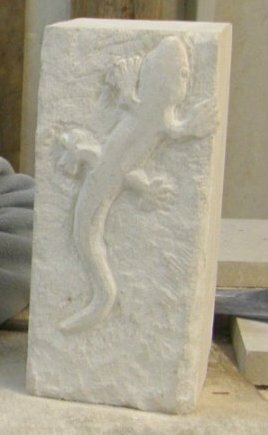 Anne came for the day on Sunday and made a really lovely Gecko carving (see below). With friends Sylvia and Brenda also here on Sunday it was great to have a really busy and lively vibe in the workshop – lots of hard work and fun! See herefor more photos from the weekend.